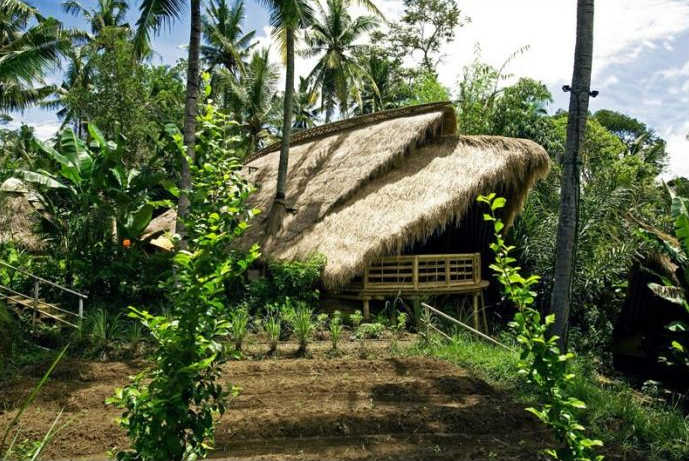 While the theory of Permaculture can be described in a list of principles, the application of these principles is infinitely diverse. 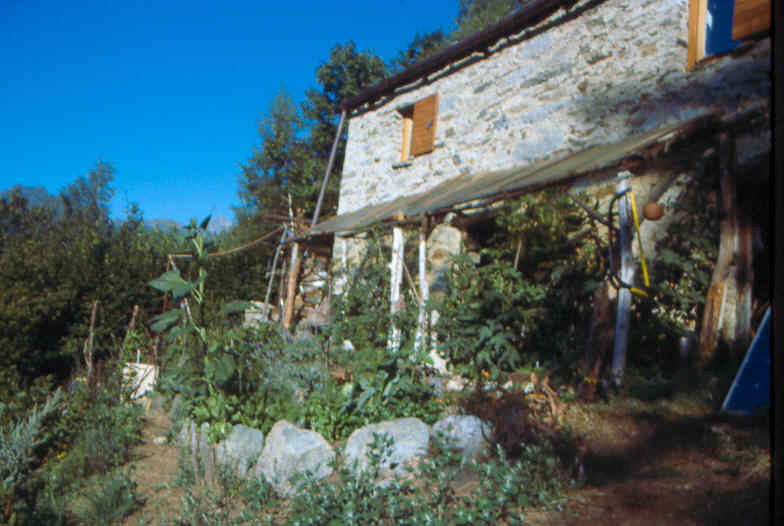 Permaculture recognises the relationship between people and the land, and consciously seeks to assimilate the natural and actual characteristics of all elements in a design subject (whether broad landscape or farm or house block or apartment, etc) into a practical expression: the design. Each situatation is different, and requires specific response to achieve harmonious design. This includes the individual characteristics – physical, social, psychological – of the person or people who are occupying or using the land. We all have different priorities which direct our lives, and these same priorities exert a significant influence on the space which we use, whether it is a large rural holding, or an apartment in a high-rise building. What makes a design ‘good’? What are the particular qualities of a garden, or a house, or a landscape, that make it ‘beautiful’, or ‘comfortable’, or ‘inspiring’, or ‘peaceful’? Just as life is a dynamic and constantly changing process of complex interrelationships, so design is a reflection of nature’s diversity and dynamism. By identifying the distinctive characteristics of each site and the people associated with it, I believe that I can develop a site that will be both functionally efficient and productive, and also a source of constant inspiration and regeneration to whoever is living or working on it. Beauty ? productivity ? energy-efficiency ? satisfaction. The same basic principles apply to designing gardens, buildings, landscapes or apartments, although the results are as individual as the people and situations. The Case Studies show examples of my designs and implementations. 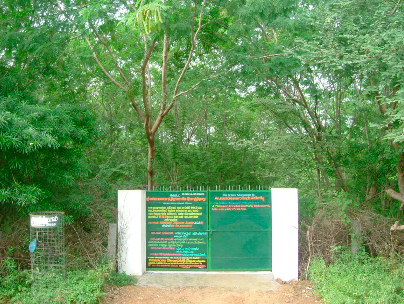 In 1988 I was asked by John Seed, founder and Director of the Rainforest Information Centre (RIC) to co-ordinate the Annamalai Reforestation Society’s project to green the sacred mountain of Arunachala in South India. I worked for the next 8 years in this role, and the mountain reforestation has advanced a long way since then. Now there is a collection of different organisations working together to ensure the the success of the project. 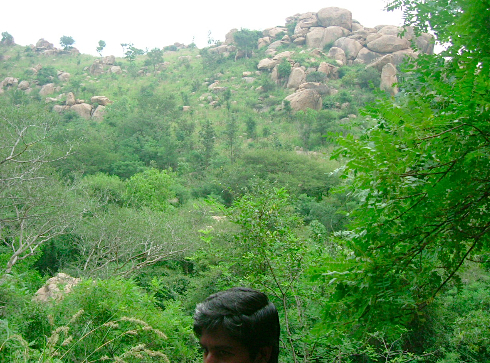 Project Arunachala in Tamil Nadu, South India, has been supported by RIC for the past decade. 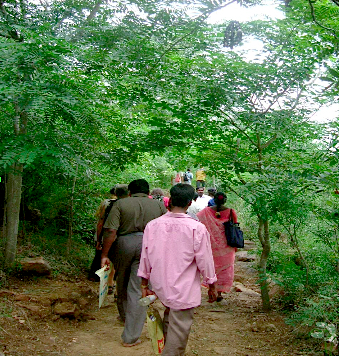 This afforestation and environmental regeneration project was initiated in 1988 by the initiative of Apeetha Arunagiri, an Australian woman who had been living for many years at the foot of the sacred but barren mountain of Arunachala. Ms. Arunagiri contacted RIC with an outline of the situation, and a plea for support to the Annamalai Reforestation Society (ARS) which she established to regenerate the mountain to its former forested . In spite of the fact that the district is far from rainforest, being classified as semi-arid, the plea was so convincing that the decision to work with the project was taken. 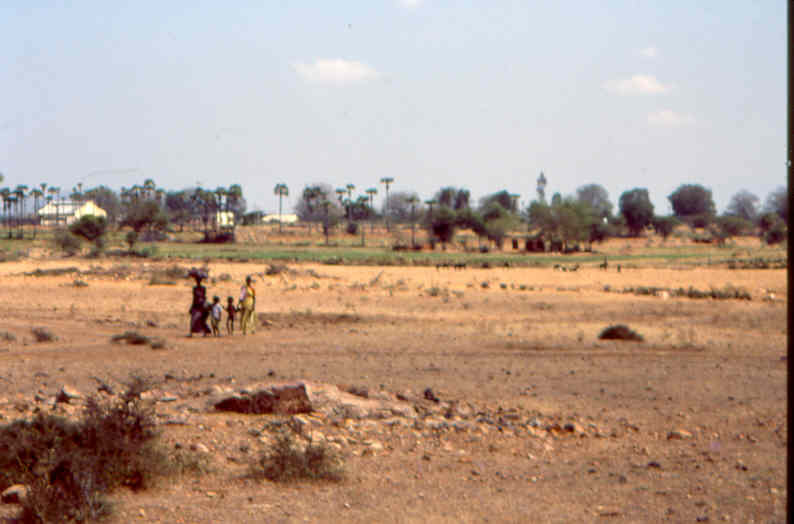 While the longterm aim is to reforest Arunachala, if the surrounding area is not abundant enough to support the people, then all resources from the mountain would rapidly be exploited. So, apart from planting and seeding the barren slopes of Arunachala, the project has focussed on environmental education, establishment of nurseries, skills training and credit schemes in villages, the refurbishment of traditional gardens in the main temple. This temple garden is now the largest in all of India. Also on temple lands, the Project has regenerated wastelands into productive food, fodder and timber forest. 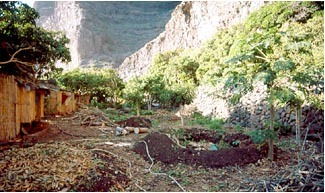 This demonstration has used techniques replicable by anyone, individual or community, regardless of wealth, and stands as a shining example of the potential for the regeneration into productivity of thousands of hectares of land now lying barren through inappropriate landuse. The practical proof of the success of Project Arunachala is that local volunteers have taken on the running of the ARS totally, and have secured adequate funding to maintain the main activities of the project from diverse local sources and from visitors to the sacred mountain. The RIC remains committed to sourcing support for the ARS where possible, and maintains a close relationship with the ongoing expansion of Project Arunachala. In 1996, Eshana and I visited two projects in India which RIC Projects has supported over the years. 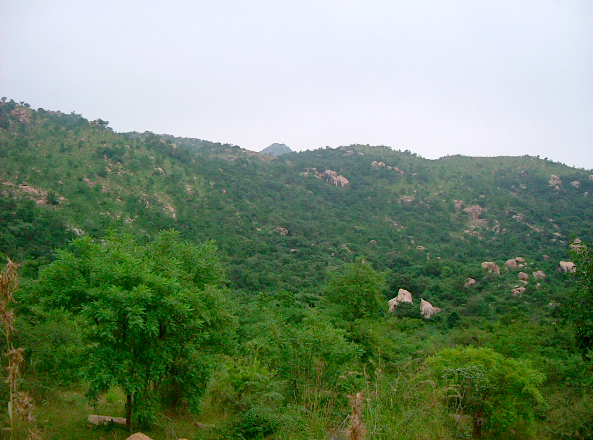 The first was the reforestation of Arunachala. According to Hindu legend, there was once a meeting of the trinity of Gods at which Brahma and Vishnu complained to Shiva that the intensity of his manifestation (as a brilliant column of light stretching from infinity to infinity) was dazzling them, could He kindly moderate his appearance? 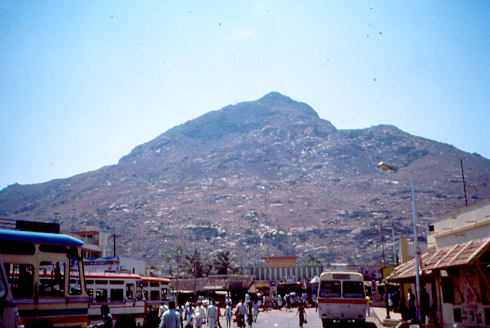 He consented and henceforth materialized as Mount Arunachala, located near Tiruvanamalai, between Madras and Pondicherry, Tamil Nadu, India. Eight years ago, the Rainforest Information Centre received a letter from Apeetha Anuragiri, a nun at the Ramana Ashram located at the foot of the mountain. She wrote to us of the degradation of the sacred mountain. At the turn of the century when the great saint Ramana Maharshi had found enlightenment at Arunachala/Shiva, the mountain had been clothed in a great jungle and even tigers might be found walking on His flanks. Now, nought remained but thorns and goats. 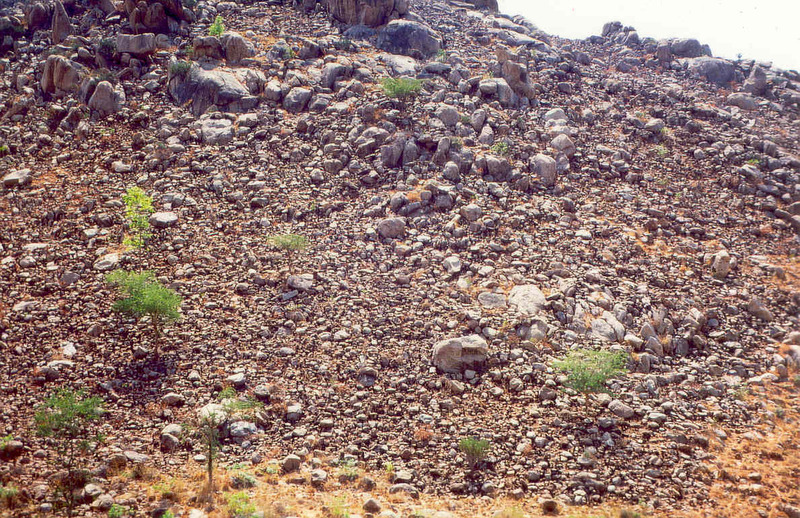 Each year, the monsoons trenched His sides with deeper erosion scars, couldn’t someone do something? I was able to find funding for the project via the Australian government aid agency, AusAID, the Threshold Foundation and others. In September this year, Eshana and I spent a week at Arunachala. We were so excited to see the barren mountainside coming to life. Because of the importance of this place to Hindu pilgrims, one of the largest temples in India is found at the foot of the mountain, parts of it dating from the 9th century. The temple is surrounded by two huge outer walls with a space about 50 metres wide between them. Six years ago, this space had been a stinking wasteland of rubble and garbage. Now, ARS has a vast tree nursery there employing some dozen people and growing hundreds of thousands of native trees annually for the mountain plantings and also for the government forestry department and for neighboring villagers. They also grow endless flowers for the Temple’s pujas which ensures the cooperation and goodwill of the temple authorities. On the mountain itself, as the monsoon was over, the main ARS activity while we were there was guarding the plantings, making sure that fires, goats and firewood collectors are kept away from the young trees. Once the rains begin, hundreds of people are employed planting trees and protecting them with rock fences where necessary and earth bunds to slow the passage of water and direct it to where it is needed. We lived there with John Button (2) at the site of ARS’s model permaculture project, miraculously turning 12 acres of desert into lush productivity. 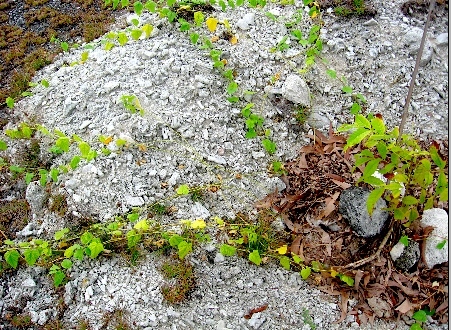 It was amazing to see this bouquet of green suddenly sprouting from the rocky desert. Many trainings and demonstrations in permaculture are held there and surrounding villagers are taught how sustainable land-use patterns can provide food, fuel, fodder, herbs and medicines in the process of the restoration of even severely degraded land. 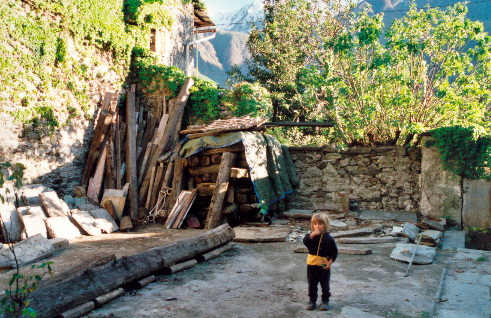 In June 1996, Anja Light (3) who had been managing RIC Projects during my sabbatical, was able to get a grant of about $15,000 from AusAID to match a similar amount that RIC had raised privately in Australia for the work of ARS. 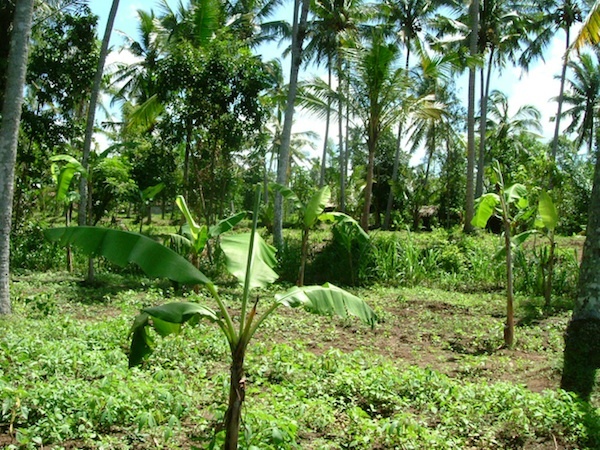 This is to fund maintenance and protection of the plantings and the permaculture farm, for the running of courses and night school classes on sustainable agricultural methods, for printing educational materials and to initiate the development of a medicinal plants project on 25 acres of degraded land. What an honor to be associated with such exciting and important work. (1) Annamalai Reforestation Society, C/o Sri Ramanasramam, Ramananagar, Tiruvannamalai, Tamil Nadu 606603, INDIA. (3). Anja Light has worked as a volunteer for RIC for over 10 years, working in Sarawak on behalf of the Penan, conducting roadshows in Japan and elsewhere. For two years she directed RIC’s 3rd World conservation project work and has now handed it to John Seed during her rainforest roadshow of Japan. Some other interesting links regarding the on going situation on and around the mountain. Piedmonte, Italy – Temperate climate. This design was for a town villa constructed in the 16th Century. 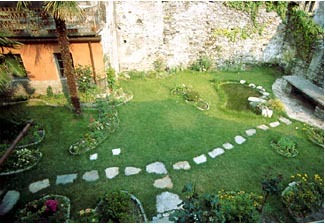 Previously there were considerable gardens attached to the villa, extending down to the river. However, the growth of the town has swallowed up this land, so that the villa has retained only a small parcel of its former site. This area, measured 28 metres by 24 metres at its largest, and all but the western side being enclosed by stark walls. The requirement was a garden which would reduce the impact of the walls, require little attention, and be always beautiful in keeping with the villa itself. No structure was to touch these walls. Almost zero maintenance is required in the long-term, using perennial plants which form beds of total groundcover. At the same time, careful attention has been given to ensure that the garden beds are colourful throughout the year. The dominance of the walls has been reduced by creating flowing beds that ‘flow’, both horizontally and vertically, thereby removing the straight lines that emphasise the walls. In addition to the varying height of the beds, the diversity of trees and shrubs adds texture to the landscape. A variety of trellised creeper plants flower in different seasons. The garden beds have been designed both to achieve beauty and provide spatial variety: open space to retain recreational utility (games, groups of people);water space to add coolness, tranquility, reflection of light and wind; and private space for solitude and reflection. The small hillock with Acer and Cornus trees and a variety of smaller plants, adds dimension, effectively increasing the sense of space while providing a screening effect for more privacy in the proposed pavillion at the southern end of the garden. The area to be designed was 17 metres, by 11metres, bounded by the walls of the neighbouring houses, the palace to the north, and open on the southern side. Plenty of light offered good opportunity for plant growth, with protection from cold winds. The garden of such a centre should be integrated into the process of healing, by incorporating “Health-Art-Environment” actively into the design, not only to provide aesthetically pleasing space, but also to reinforce the activities of the centre. 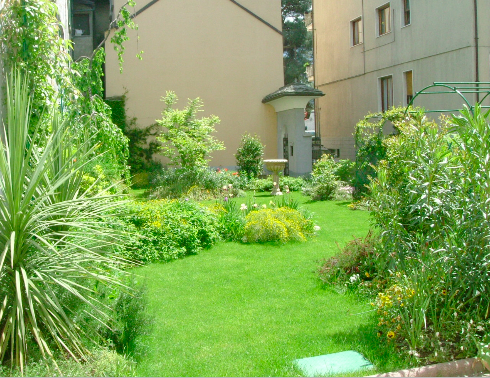 So, the garden should be a place where clients and participants and therapists can be soothed, inspired and stimulated. It needs also to serve as a performance and exhibition space, where people can gather as a community. The design seeks to incorporate the garden into the Centre’s themes in a variety of ways. Different parts of the garden are devoted to individual tones and shades. The colours of the beds are dominated by reds, or orange-yellows, or whites-creams, or blue-lilacs, and by blending of colours, whether extravagantly vivid, or cool and subtle. The changing seasons are intended to be changing variations of these same patterns. The aim is that there should always be beauty – in colour, form and texture. Species have been selected with this in mind. Straight lines are generally avoided, since these tend to break the garden too sharply into separate spaces, whereas the use of softer, rounder lines allows a more harmonious integration. By increasing the amount of edge (between path and garden, pond and earth, for example) we also increase the amount of area in the garden in which the dynamic effect of edge occurs. The meeting point between two different environments (land-water, forest-field, day-night, path and verge) is occupied by both species from those two environments plus other species particular only to the interface. Once again, diversity is increased, and hence the health, stability and resilience of the garden improved. In the case of the gardens, the use of ‘keyholes’ (in effect ,.round garden beds rather than conventional rectangular ones) allows access to larger garden beds without need for more path area. As well, these ‘keyholes’ offer interesting possiblities as individual spaces where art can be displayed as separate works rather than in a more conventional grouped situation. The different access points in the different garden beds permit privacy not so easily achieved with ‘straight-line’ gardens. This design incorporates two specific places intended as solitary sitting corners where clients can enjoy solitude or intimacy unaffected by the normal functioning of the garden and visitors. Too often the potential of vertical space in a garden is ignored. The walls offer the opportunity of both increasing the productivity (through espaliered fruit trees, and vines) and the beauty through growing colour and texture upwards as well as horizontally. Through this vegetation, the dimensions of space in a garden change, through a merging with other vegetation and building surfaces beyond the boundaries of the garden that are otherwise strongly differentiated by the solid wall. This makes the garden appear larger than it actually is. The incorporation of structures into the design increases both the function and the beauty of the garden. Gazebos in both southern corners not only serve to provide more intimacy and shelter from rain, but also offer vertical space to be used to grow beautiful and productive plants which in turn enhance the privacy. When an additional level is added to the gazebo in the south-east corner, there is the potential for more growing space, as well as a ‘cubby house’ for children, or an elevated audience box for watching performances on the stage or in the garden. 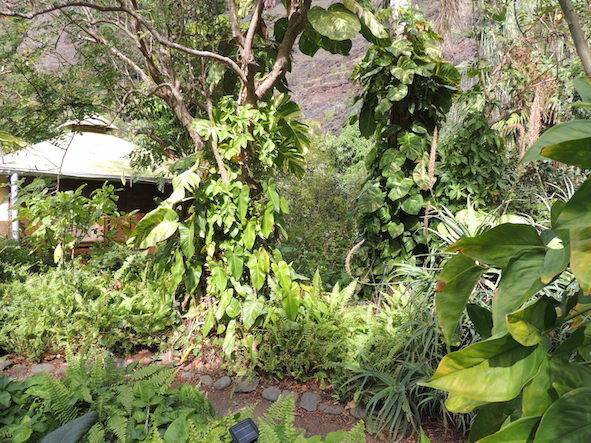 By growing more climbing plants, and hanging plants on the walls beneath the verandah, it is connected more with the garden with increased beauty and productivity. As the garden is also to serve as a performance space, so the design offers maximum potential to view the stage, without compromising the aesthetics of the garden. Curved garden beds allow each area to flow into the next instead of creating disjointed and divided spaces. At the same time, plant species are selected to afford unobstructed views of the stage, with all taller species placed on the walls, and the beds within the grassed area planted shorter species. The stage, constructed from an existing large stone slab salvaged from the site, is erected at a height which enables it to be used as a table at other times. 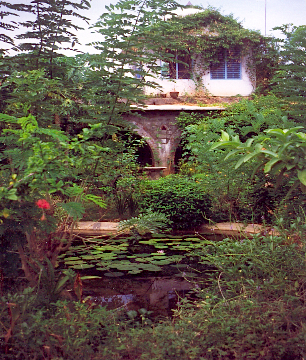 The pond is a central theme of the garden, both aesthetically and functionally. Aesthetically, it is a beautiful focus for the garden, with water circulated via an ornate spout and cascade as well as a fountain ensuring maximum oxygenation and therefore the greatest potential for abundant fish and plant life within the pond. Additionally, the humidity around the pond creates a rich microclimate for diverse plant species. Water is a calming, contemplative medium, and the reflections from light and breeze across the pond surface will play on the surrounding walls. Functionally, it serves to focus the stage area from the rest of the garden, thereby enhancing the performance space.Also, intimacy of the pavillion in the SE corner is accentuated by both the pond and cascade. 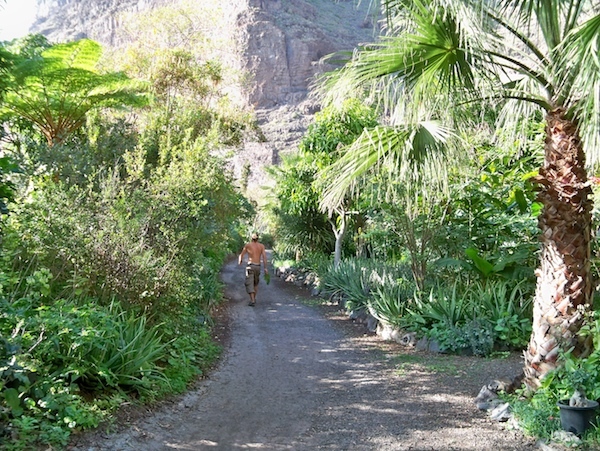 La Gomera, Canary Islands – Sub-Tropical. A community of 25, and hotel with 30 beds; one and a half hectares of land occupying three flat terraces directly on the edge of the ocean; totally hemmed in by five hundred metre cliffs, facing north-west; dry sub-tropics. Re-design it! One important facet of Permaculture design is to recognise limits, identify their characteristics, then seek to stretch those limits; to minimise the negative, and maximise the positive. If we succeed in this, then the design has achieved a more sustainable situation, less constrained by by extremes, more productive through greater flexibility, more liveable. My impressions of the site were of a mango monoculture; the overwhelming presence of the ocean and cliffs; minimal productivity; community stress; insufficient intimate space; aesthetics neglected. Plenty of scope for redesign. Neither the ocean, nor the cliffs, can be removed! However, through improving the beauty of the site, at least there can be more distractions to moderate their dominance. More diversity will greatly increase the insect and bird life. Attracting more winged creatures will significantly improve the rate of pollination of all vegetation on the site, thereby increasing pollination and so productivity. The first step was to remove a significant percentage of the mangoes; 80% was a reasonable aim, over a two year period. When the plantation was originally laid out, at least twice the density of long-term trees was planted, with the intention that more profit could be earned in the early years, after which they would be thinned out. This was never done, with the result that the trees had all grown together, and provide considerably less productivity than should be expected. In addition, the majority of trees were a variety of inferior quality and less marketable. In cutting out so many mangoes, a huge amount of organic material (leaves, branches) needed to be disposed of. 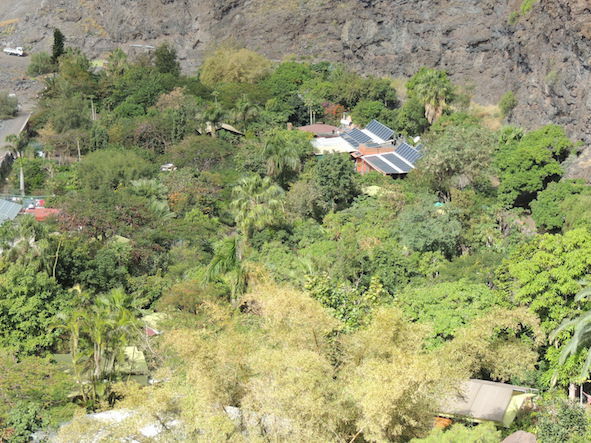 One premise of Permaculture is ‘The Problem is the Solution’: an issue of perspective. 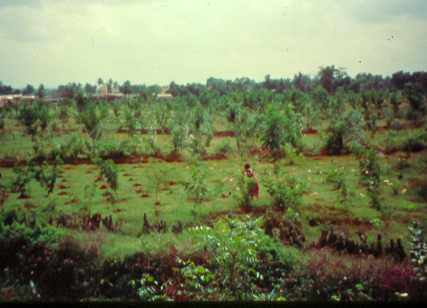 The mangoes had not only formed a monoculture, but in doing so had also minimised diversity of soil organisms and hence the soil structure was very poor. Mango leaves do not decompose easily, since they are unpalatable to most animals and insects. However, in the presence of moisture, they break down quite readily. ‘Sponges’ provide a perfect solution: excavated basins up to a metre deep and two or three metres in diameter, of variable shapes. These are filled with the leaves and all but the largest branches, as well as any other organic material, including some manure to speed up the decomposition process, and a significant amount of watering initially. This was an effective means of disposing with the debris from the mango trees on-the-spot. Equally important, each of these sponges becomes a concentration of moisture and nutrient available to all plants nearby, from trees to smaller species planted in the diverse microclimates. By creating these sponges throughout the site, nutrient and moisture is also distributed thoughout, and the massive increase in soil organisms at the sponges percolates with the increase in soil moisture. In addition, the huge increase in light enables a greater diversity of species to be planted. 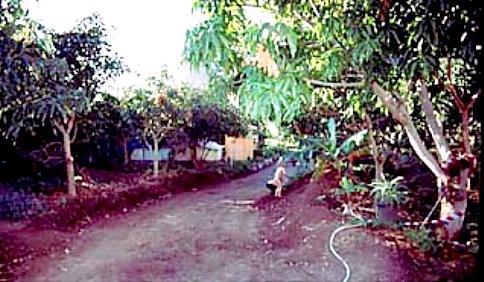 Instead of being able to see considerable distances beneath the canopy of the mango trees, there was now the potential to easily create privacy through dense plantings of multi-layered vegetation. Of course, all these extra species could be selected to provide an enormous increase in food production as vegetables and fruit (with saving from the purchase of food outside, and a guarantee of high quality freshness too), and flowers for beauty and smell. In turn the wildlife attracted adds both to pollination and productivity, and also contributes to the re-cycling of biomass. By using this technique of ‘sponges’, many of the short-comings of the site were addressed. Instead of a monoculture, there was the potential to create a diversity of living spaces, recreation areas, and places to retreat and reflect. The implementation of a greywater recycling system significantly increases the water potential. Several medium-sized ponds scattered throughout the land offer possibilities for aquaculture systems, for recreation, and simply for distinct areas of very different microclimates. Aquaculture has the capacity to be much more productive than any land-based culture: it can also be very beautiful, and provide a significant cooling effect. 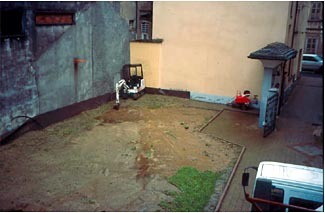 House site – barren land abandoned for any use. 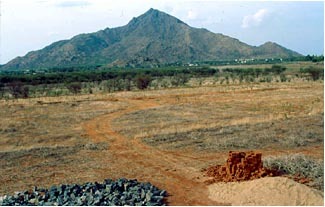 A one hectare site in tropical, monsoon South India, 100kms from the coast. The area is frequently plunged into prolonged drought, with the water-table dropping ever lower as inappropriate crops requiring excessive irrigation are increasingly being planted. The temperature in winter varies between overnight 20degrees, and daytime 30 degrees; in summer, night temperature is 30-35, day 40-45, with close to 100% humidity as the monsoon rains approach and temperatures reach their peak – a very taxing environment to live in. With such an extreme climate, very specific strategies need to be adopted, for house design and construction, as well as for gardens and orchards. The climate of the house can be considerably modified by thoughtful garden design, making it cooler through shading, through siting of water bodies, and encouraging fresh breezes towards the living areas: one creates “living air conditioning”. Total groundcover is essential, to protect the soil and prevent any soil-moisture loss through evaporation. All water entering the land as rainwater or run-off from outside must be trapped within the land, to replenish groundwater resources, and to water all plants. Water to be used as many times as possible through recycling. Also, any water leaving the land during rains carries with it precious topsoil and organic material, depleting the fertility and productivity of the land. 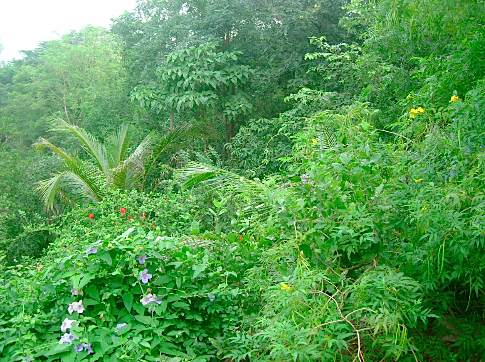 In the tropics, the extremes of prolonged heat, drought and torrential monsoon rains, combine to promote severe erosion, rapid breakdown of organic material, and consequent loss of nutrient for plant growth and health; the only means of addressing this situation is through constant renewal by promoting plant growth. Fertility is held in the biomass – plant material, both living and decomposing, feed the natural processes of renewal. 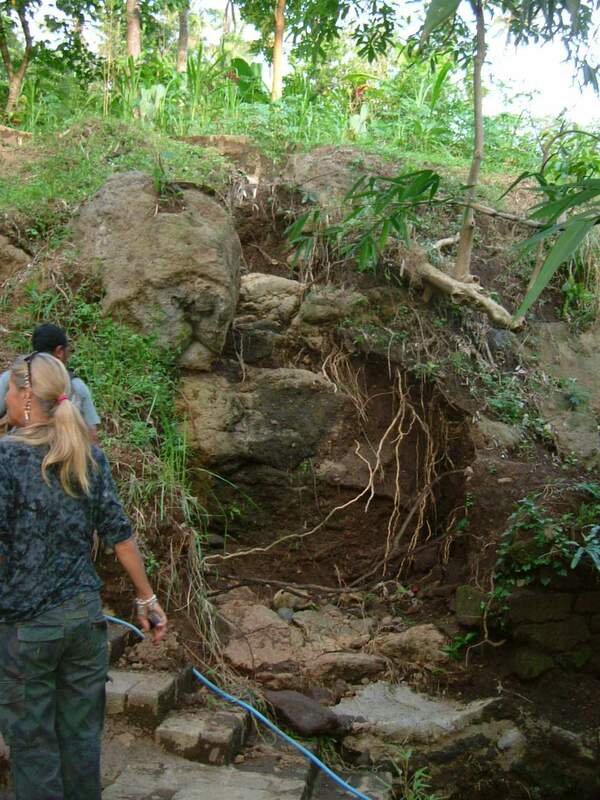 Earthworks were done initially in the form of contour trenches and mounds to prevent any runoff, and to provide landscaping to allow all water to be absorbed, even during extremely heavy monsoon rains. This is the macro-water management. In addition, all planting was done using a system of earth mounding to create a U-shaped dyke on the lower side of every plant, holding water at every plant or tree, and any topsoil and organic material accumulating there: micro-catchments. Most social living is on the verandahs, (screened against insects and cobras) 3m wide around all sides except the hot West, where storage room provides extra insulation. The single large room downstairs is mainly a retreat in the heat of summer, plus cupboards and quiet non-social area. The bedroom upstairs attracts all cooling breezes, has its own verandah, is built against a large water tank for extra coolness. Domed roof encourages quietness, has a brass solar-chimney to vent any heat. My ‘home’. At almost 1200metres in the Italian Alps, we live well beyond the classification of ‘mediterranean’, or even ‘temperate’: definitely ‘alpine. Local people said that the land was ‘only fit for potatoes and onions’. We are perfectly happy to eat these, but not exclusively. Variety is the spice of life. 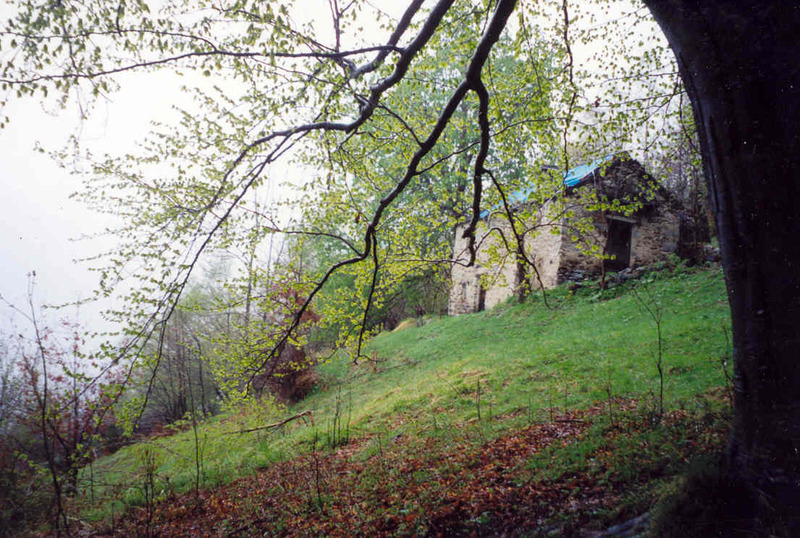 The house is isolated, a half hour walk up from the road. Most significantly, this means that what we need, we must either find in the forest around us, or carry it on our backs in. Or grow it! The main water source is a pure spring, and the other a river. However, winter and summer can be difficult; frozen pipes, and near-drought conditions. There was a high priority to ensure maximum water is held on the land by contour trenching to slow all water runoff, channeled to lined ponds to ensure no risk of being without water. Tanks collect roof runoff as extra backup. The slope is steep, so gardens are terraced around contour, with stone walls as support material and for absorption and reflection of heat. Warmth-loving species are planted next to all walls. Root crops and grains are important as storable food, berry fruits, stone fruits and nut trees have been planted extensively. Fruit trees are fertilised by well-decomposed toilet compost. Garden productivity is maintained by other compost, including worm composts. Maximum emphasis on recycling to avoid any unnecessary carrying in or out to/from town. I regularly teach courses and workshops in Permaculture and specific aspects and applications of Permaculture. While attention is paid to providing intensive understanding of the principles and theories involved, I also believe in the need for application in practical situations, and that learning must be done in an atmosphere of enjoyment. Learning should be fun! All courses and workshops are designed and conducted with this attitude strongly in mind. I believe that at least 80% of all those who attend a Permaculture Design Course will never perceive landscape in the same way again – their attitude will be changed forever. A significant claim indeed! Who are these people, and what is their aim in doing a Permaculture course? Landscapers, householders, environmental consultants and students, town planners, architects, development personnel, men and women: all kinds of people interested in broadening their perspective on their environment and acquiring a practical and vital foundation to apply directly to their specific situation. 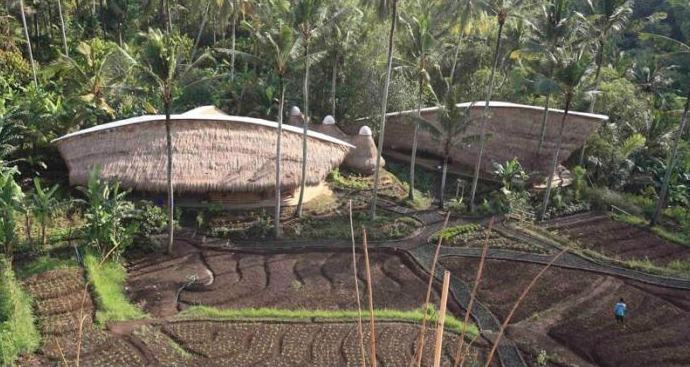 Master Plan for the Green School, Bali, Indonesia. 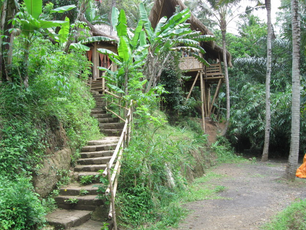 In 2006 I was invited to create the Master Plan for a new school being established in the verdant hills of Bali. The intention of the school was that the school grounds of around 7 hectares should be an integral part of the educational curriculum for the students, with Permaculture as a basis for the relationship of young people with their environment. The school opened in September 2008 and has received wide coverage not only in academic circles, but has won international recognition for its innovative and evolutionary approach to education. Regeneration of Turtle Island., Bali, Indonesia. Following my work with the Green School, I was approached to consult on the regeneration of Turtle Island. 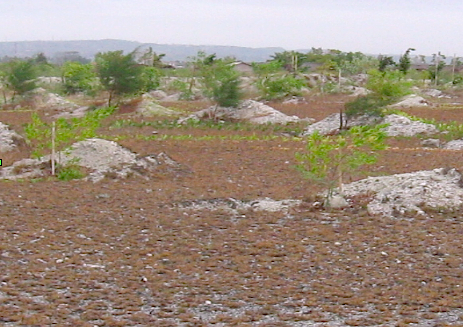 a barren land of sand and coral attached to the main island of Bali. 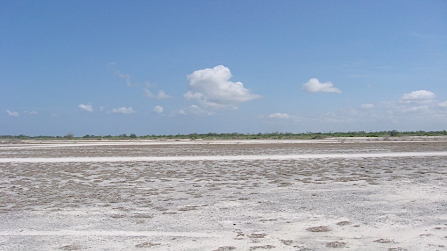 Originally a much smaller island, the size was expanded significantly by the saline material reclaimed in the dredging operation to deepen the main port for Bali. Through ensuring that not a drop of rainwater was lost to the ocean, the existing freshwater lens was greatly enlarged to ensure easy access of the roots of the plants used in regenerating the wasteland. Selecting species perfectly adapted to the extremely harsh conditions, the process of regeneration has been remarkably enhanced and increased. With the soil all covered, volunteer species arrive, and explode. The soil surface that was hard and hot, is transformed to soft, shady and cooler. And now, a young forest, full of life and animals and birds that will constantly fertilise and add to the biodiversity. Hope you remember me and family… Satish, Dr. Beena & Gowri from Tiruvannamalai. Presently we are living in Mysore. Hope everything is fine with you. Can I have your contact number and e mail id.I wish to get in touch with you personally. Convey my best wishes and regards to all. That is a really interesting proposal to think of the idea of running a workshop in Permaculture at the Uni; I suggest that a full two week internationally recognised certificated Permaculture Design Course would be the best means of accurately transmitting a clear understanding of Permaculture, or we could think towards a specific other mode of presentation. There would be many possibilities. Setting up a working model of Permaculture design focused towards creating sustainable self-sufficiency for the maximimum in minimum space with optimum productivity. My skype name is johnbutton34. Why 34? No idea – it’s what I was offered, and not an attempt to give the impression of eternal youth. My my, what a long time ago I was 34. Gosh, a quarter of a century, we can now say? Ha, talking of eternal youth, most of my body hair fell out when I was very sick (there is so little hair on my head that Fate did not bother with it! ), but with my ‘new’ 39 year old liver, when it grew back, voila’, it was red again! Anyway, that’s a digression. What I started to suggest that we could skype sometime. That would be delightful anyway.